That Devil Music: Mick Farren's Final Album Released! Mick Farren's Final Album Released! Sadly, British music journalist and infamous rocker Mick Farren passed away last July, collapsing on stage while performing with a new line-up of his legendary 1960s-era band the Deviants. An influential rock critic from an era where writing about music actually swayed opinions, Farren's work for noted U.K. weekly New Music Express and for the International Times earned him a reputation as an insightful critic and writer. It was Farren's tenure with the Deviants that cemented his rock 'n' roll legacy, however, the notorious cult band releasing three influential and ground-breaking albums between 1967 and 1969. Before his death, Farren had all but finished his final album, working with Deviants bandmate Andy Colquhoun on The Woman In The Black Vinyl Dress, released by Gonzo Multimedia in the U.K. “The initial vocal tracks were laid down by Mick in February 2012 at Brighton Electric," says Colquhoun in a press release for the new album. "Jaki Miles-Windmill added backing vocals, and some percussion at this session. I took the vocal tracks to my studio, Cybermusik, and overdubbed guitars, bass, drums, keyboards and more backing vocals, and also put the poetry in a song structure.” Colquhoun put the album together over a six month period, mixing the album in August 2012. The Woman In The Black Vinyl Dress was released on October 28th, 2013. Farren's legacy extends far beyond music. A prolific writer, he had penned nearly two-dozen books during his lifetime, including several novels, books of poetry, a couple of autobiographical books, and four well-received books on Elvis Presley. For five years, from 2003 to 2008, Farren was a columnist for CityBeat in Los Angeles. From the 1970 release of Mona – The Carnivorous Circus, his solo debut, Farren has never strayed far from music. Through the years, he would record a number of albums, including the acclaimed Vampires Stole My Lunch Money, which included Chrissie Hynde (later of the Pretenders) as well as a handful of albums with a reunited line-up of the Deviants. During his storied career, Farren also collaborated with artists as diverse as Wilko Johnson of Dr. Feelgood, Wayne Kramer (ex-MC5), Lemmy of Motorhead, and Hawkwind, among many others. 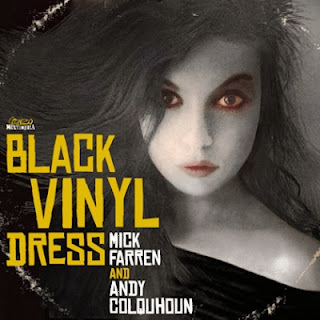 His final collaboration with Colquhoun on The Woman In The Black Vinyl Dress represents the last entry in his artistic canon and a fitting swansong to an influential and free-thinking rock 'n' roll legend. Related content: British Rocker/Writer Mick Farren, R.I.P.